It was a proud moment for Bhutan to finally host the SAARC Regional meet to discuss policies to enhance women in business. But the event unveiled startling revelations; in a mountain of data and evidence presented by all the representatives from the SAARC regions, Bhutan was the only SAARC member country to not have a separate platform for women entrepreneurs, with available data on women entrepreneurs scattered across different agencies, thereby paving the way to discuss why Bhutan needs one for the growing women entrepreneurs. Women entrepreneurship is a growing phenomenon; with social movements, changing societal values, and a rapidly globalizing world, the number of female-owned businesses is on the rise. The scope of women-owned business ventures is truly staggering, with more than 126 million women entrepreneurs starting or running new businesses in 67 economies in 2012 (Global Report on Women and Entrepreneurship, GEM 2012). In the majority of SAARC’s member countries, however, the gender gap is vast, with women receiving little to no professional opportunity or financial support compared to their male counterparts. In India, women entrepreneurs constitute only 10 percent of the total number of entrepreneurs in the country. Like an age-old adage, the appeal for a separate platform for women’s issues be it in any field has often been met with scrutiny, so why did the conference highlight so much on the need for a separate chamber of commerce for the women? “Women don’t come forward much in mixed company,” says Damchae Dem. ‘By that I mean, women only feel comfortable to raise issue regarding their business in meetings where there are only women. Women in families have always considered themselves secondary and fail to voice their dreams.” A woman’s domestic responsibilities as a mother, wife and daughter are also reasons why women are at a disadvantage when trying to keep a business afloat. A lack of self-confidence and insecurity in one’s ambition also serves as a severe detriment to the development of women entrepreneurship. Mariam Khan, a professor and corporate trainer from Pakistan, insists that, “Women should believe in themselves, they are not less than men in any field. Wherever they can put their heart and soul into, they can achieve a lot.” Many agreed that the lack of infrastructure, training and adequate information for women who are interested in running a business can dampen their perception of success. A world wide study conducted by Global Report on Women and Entrepreneurship exposed the fact that women have “lower capabilities” perceptions than men. The extreme setbacks that women entrepreneurs face are further woven into a complex web of rigid stereotypes, societal expectations, personal resolve, lack of resources, and a general deficit of awareness required for this issue. 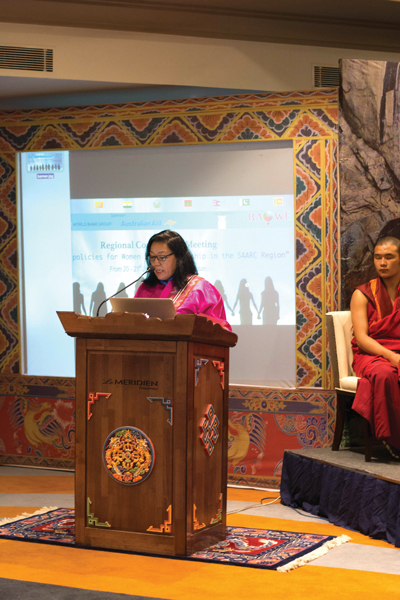 For Bhutan, the dire absence of properly implemented or widespread support for women entrepreneurs is an issue that needs to be addressed in this period of economic growth in the country. 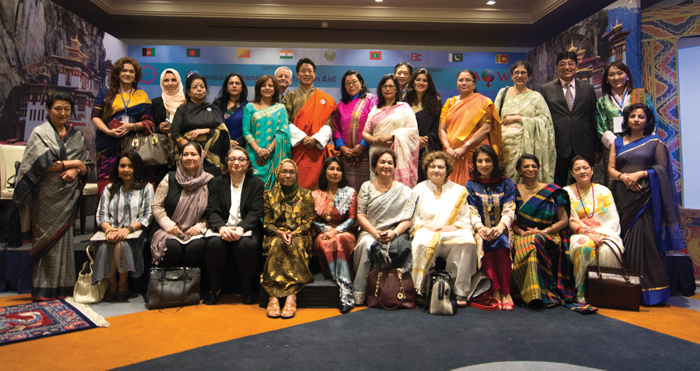 Member countries such as Bangladesh have established a Bangladesh Women Chamber of Commerce and Industry with an aim to encourage and strengthen women’s participation in the private sector as entrepreneurs through promoting a women-friendly business environment. In Sri Lanka, a Chamber of Commerce has also been created for women. “We may not have the data to show like our neighbouring countries, but although the process of change started much later for Bhutan, our country has come so far. Because of the leadership of our Kings, our small country has done so much to help entrepreneurship in general,” remarks Damchae Dem. Other SAARC nations have reliable data about women entrepreneurs and know how to initiate activities to boost women entrepreneurial skills. The future, whether it be for Bhutan or South Asia in its entiretity, holds the potential for women to rise to the forefront of society as leaders of innovation and novelty in their business ventures. The demand for a more cohesive and sufficient infrastructure, and the need for a separate Chamber of Commerce for Women Entrepreneurs in Bhutan will enable more women to participate in business and successfully develop their skills. “Women are always scared of losing the little things but it’s time that we break out of our comfort zone. We need to be able to be bold, take charge, be brave and look beyond because life is about taking risks – but calculated ones,” concludes Damchae Dem.